Redundant content is one of the most common issues content managers run into. It’s a seemingly harmless mistake to make, but over time, it saps your site’s SEO potential and gives your readers a poorer experience. If you’re going to run a well-organized blog, you need to deal with redundant content. Here’s how you can do that. 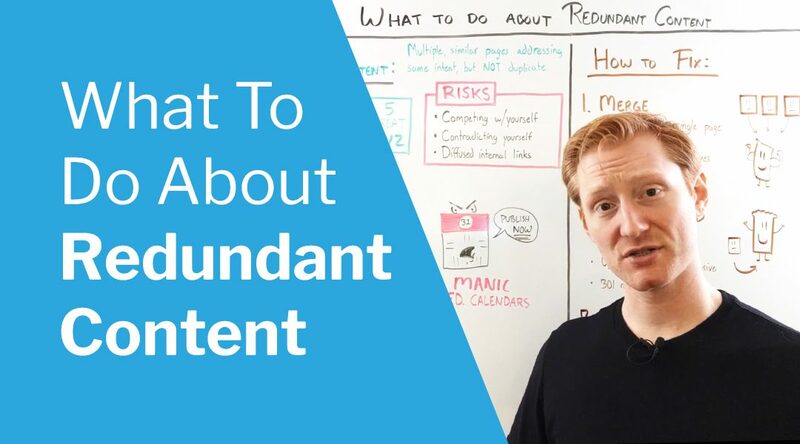 Hi friends, I’m Jeffrey with Overthink Group and right now we’re going to talk about a really common problem that companies face when they’re doing their content marketing: redundant content. Now you’re all familiar with duplicate content, but that’s not what we’re talking about. Redundant content is what happens when you have multiple pages on your site that are trying to address the same user intent. So although the words are unique and the content is very different, functionally it’s all the same. Well, all three of these posts are very different. They don’t match in terms of words, but if you think about the intent or the reason why someone would be reading these posts, it’s about the same. They’re all trying to help people make better, perform better interviews by asking better questions, and so that’s what we’re talking about when we say redundant content. Now, redundant content opens you up to some risks, one of which is that your content is competing with itself for positions in the search engine results pages. That’s not good. Another problem is that over time you run the risk of contradicting yourself, which doesn’t look good for your brand and it doesn’t give your readers a really good experience. They’re saying they’re seeing you say one thing in 2011 saying another thing in 2014 and you’re tearing them apart. Thirdly, you get diffused internal links when you do a lot of this redundant content. Let’s go back to that hypothetical example. If you published a blog post about the top 10 interview questions in 2011, then in subsequent posts when you mentioned interview questions, you should have been giving that blog post and internal link. You should have been linking back to that, but then later on in 2014 you publish that next blog post on interview questions. Well, now where do you link to when you’re mentioning interview questions? And then the problem gets tougher as you have more of those redundant pages. So instead of just building internal links to one authoritative page on asking good interview questions, you’re defusing those internal links across the rest of your blog. Not that great, again, not the best experience for customers and not the best way to structure your content in general. Now you might be wondering why is redundant content so prevalent? Well, there are three really, really common causes of redundant content that I’ve seen. Some people have many authors contributing to their blog, and this is not a bad thing to have so many authors. In fact, it’s one of the reasons why companies have a lot of the content they have. They get a bunch of employees to contribute content to the blog and that’s good. But the problem is that oftentimes you’ll have multiple authors contributing content about the same stuff and that’s where you get redundant content. You could have different subject matter experts creating essentially the same blog post from a functional standpoint, and if you don’t have your contributors aligned, then you run the risk of redundant content. Another common cause is multiple editors, so if you have many different strategists planning out blog posts, then you’re going to have some people coming to the same ideas. They’re going to think, “It would be really great if we had a blog post on improving our interview questions,” and things like that. So you just have the risk of multiple strategists coming up with essentially the same idea over time. If the leadership of your blog is changing hands from year to year, then that increases the chances of that happening for you. A third common cause is just having an unreasonably demanding editorial calendar. Now for a long time marketers believed and it made sense to publish new posts at predictable intervals, so some people held themselves to publishing once a week. Some people were publishing four, five, fourteen times a week, and that demanding editorial calendar just needed them to come up with more blog posts over and over again. It becomes very easy for content marketers to start reusing old content concepts because they’re just out of ideas and the editorial calendar is too demanding. Then ask yourself, do the results that Google show you look redundant? Do you have multiple instances of what’s essentially the same blog post or the same page showing up in that a results page? Or do you have diverse content? That’s a really easy way to check. There are a handful of ways that you can do this that work really well. Give it a clear URL, something that’s easy to remember. Then 301 redirect all the merged pages to that final destination. Then promote it and build internal links to that new, authoritative page. That’s a really good way to increase your rankings and increase your organic traffic and that’s something that has worked really, really well for Overthink Group clients and it can work well for you too. 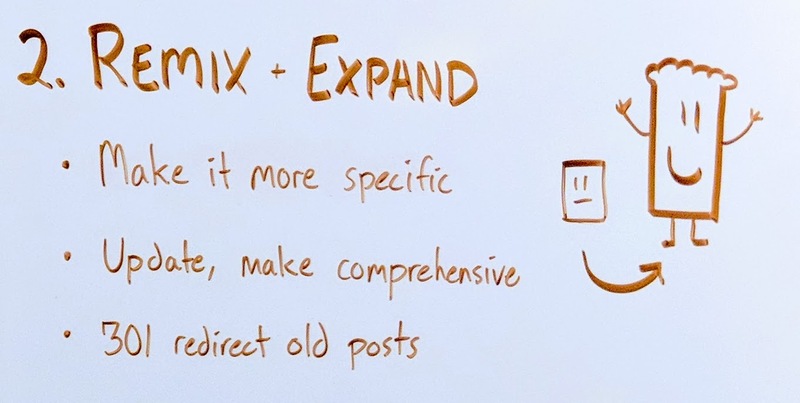 Another way to deal with redundant content is to remix and expand that content. So you might have a bunch of content of that addresses the same problem, but you could frame it in a different way. You could expand it. You could create something more comprehensive on a more specific subtopic related to what that post is about, and you can use redundant content as a starter so you’re not starting from scratch. That is an option. Just make that content a little bit more specific. Update it, make sure that it’s comprehensive, that it’s very valuable as a standalone piece, and then if you’re pulling in a different blog posts to expand it, then 301 redirect to those. 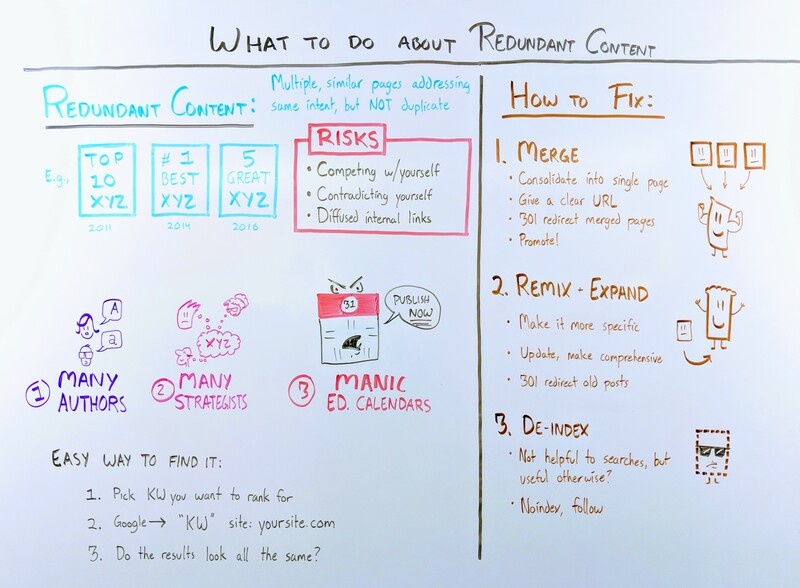 A third way of dealing with redundant content is to just de-index it, hide it from Google. Sometimes you’re going to have helpful content that isn’t all that valuable for people who are searching for the answers to problems, but it might still be useful for people who are on your email list or maybe following you on social media or it might just be something that’s helpful for sales reps to direct people to. You don’t need to delete it, but you can go ahead and de-index it so that it’s not competing with the other content in the search engine. So that is in a nutshell what redundant content is and how to deal with it. Been poking around these posts all morning. So, so helpful! Thanks Jeffrey and team! Glad they’re helpful, Matt—thanks for reading!